Turn a mobile device into a powerful tool to analyse your activity traffic. The app that allows you to measure the real world like a website. Analysing people counting, revenue, staff and social or seasonal events you can create results to optimize your activities. 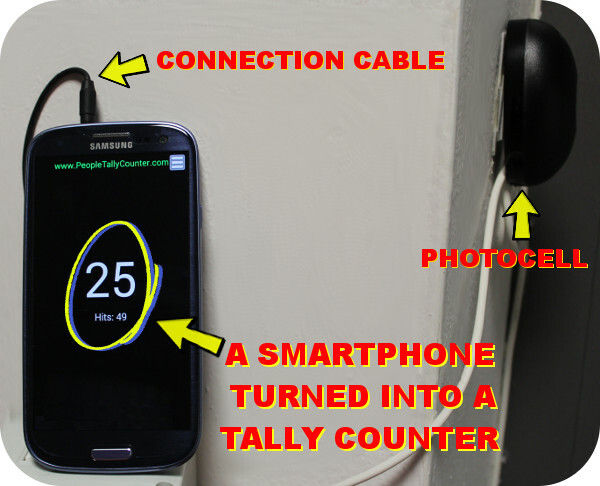 Example: people-counter smartphone connected to sensors by an audio cable. ⇒ you get a full set of online statistics and data reports. People counters are vital for correct decision making in your business activity: infact, by counting your visitors you're able to evaluate marketing actions, strategies, and many other factors about your activities. It's the appropriate way that enables you to make correct decisions. We designed and developed in house this people counting solution with an innovative APP for Android, specific web applications and dedicated hardware. This approach has given us the capability to personalize all levels between our software and the hardware, placing our people counter strategy way ahead of many competitors. For instance, our people counting system helps retail stores to calculate KPI (Key Performance Index) analyzing their marketing and instore performances and much more. → Click here for a more detailed discussion of the people counter strategic vision. People Tally Counter is an innovative supplier of people counting systems: all systems include technology that can be easily expanded and upgraded to prevent you to lose your investment. Both small and large companies can rely on this people counter system for customer traffic detection and analysis. Each people counter (from the starter to the professional solutions) incorporate the efficient technology in sensing, data collection and reporting. How many potential customers visit your store? The conversion rate is defined as the ratio of the number of transactions and the number of visitors, and it's considered one of the most important indicators of retail performance: to have a people counter means to gain a constant monitoring of the conversion rate, getting crucial information to improve your profitability. Investiment return of marketing activity is one of the most relevant parameter to realize an incisive business planning. A people counter system do represent a reliable tool to verify it by allowing the determination of both the number of visitors and the conversion rate.